When Jeff Gordon first slid into the cockpit of Hendrick Motorsports’ No. 24 Chevrolet for the final race of 1992, no one knew what to expect. What they were witnessing was the beginning of one of the most decorated careers in NASCAR® history. Twenty-three seasons, 93 wins, and four titles later, Gordon climbed out of the No.24 at the end of the 2015 season and passed the steering wheel on to his successor – Chase Elliott. With huge shoes to fill, Elliott is making a seamless transition to the NASCAR Sprint Cup Series™ that has people wondering if this is the beginning of another legendary career at the wheel of the No. 24 Chevrolet. If you’re a fan of Gordon, Elliott, or the No. 24 Chevrolet, you won’t want to miss out on the Action Racing Collectables die-cast of the No. 24 #24EVER fantasy paint scheme from Lionel Racing. 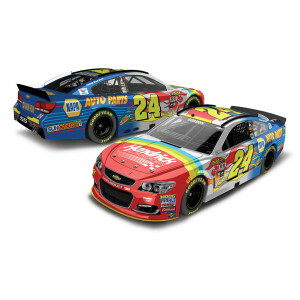 The design incorporates Gordon’s original rainbow paint scheme on the hood and gives way to the silver design carried on his final ride before blending with Elliott’s current NAPA Auto Parts scheme on the rear portion of the car. Show your allegiance to these drivers and the No. 24 by reserving yours today! This diecast is available for pre-order and will ship in December 2016. Each Limited Edition Action Platinum Series 1:24-scale hood open, trunk open collectible die-cast includes manufacturer-specific engine detail, die-cast body, die-cast chassis and detailed interior. Each collectible die-cast also features a DIN (Diecast Identification Number) for registration. This special edition of Lionel Racing die-cast features a separate Die-Cast Identification Number (DIN) that denotes its uniqueness in this limited collection, and an autographed windshield.